This was our final weekend project of the season, so the cooler mornings were already upon us in Happy Camp. Cooler is better when you are trying to encourage a bunch of people to dig out on a gravel bar! I counted fifty participants at my talk on Saturday morning. That included five experienced members who would become team leaders and help me to manage the project. Splitting everyone down into four or five separate teams would allow us to organize the work better. We always begin these projects with a few hours of theory on Saturday morning. This is so everyone will know what we are doing, and why, once we get out in the field on Saturday afternoon. I use a chalk board to demonstrate how gold follows a path down the waterway during major flood storms, and forms into high-grade gold deposits at the bottom of hard-packed streambeds. 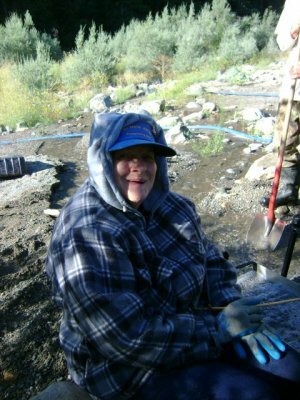 Then I explain how we use a simple sampling plan to establish where the gold path is located, and to identify which layers will produce the most gold for your effort. I explain what the rules and regulations are so members can stay out of trouble. I also take time to answer any questions that people have. Besides getting everyone oriented to what we are going to do, Saturday morning is an opportunity for me to size up the crowd. Size them up for what? For how much work I am going to be able to squeeze out of them on the following day! This particular group looked like they were ready to work hard! After giving everyone time for lunch, we met back over at our office in Happy Camp and then car-pooled it upstream about eleven miles to our famous Mega Hole property at K-15A. Some of the participants were already camping up there, so they were just going to meet us on the huge gravel bar towards the upper-end of K-15A. We have been doing these weekend projects there for the past several years. It is a great place to do high-banking because the access is so easy (does not require a boat), the gold is plentiful, and it is within walking distance of one of our most popular campgrounds. When we arrived out there on Saturday afternoon, our team leaders already had about half our group busy sampling. 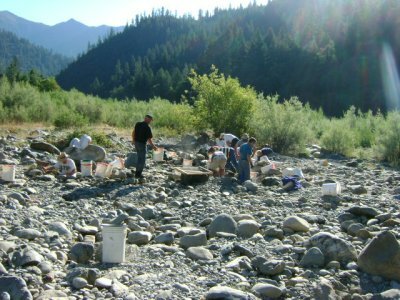 Sampling is accomplished by processing small batches of streambed material from different locations, and comparing the results, all in an effort to find a good place to get into production. We are using gold pans on these projects to process our samples. Team leader, Ray Derrick, was waiting for us when we arrived out on the bar. 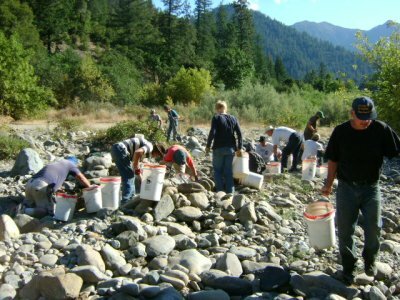 Gold panning is the first thing a beginner needs to learn in the field. This is because you cannot sample properly unless you can process material using a gold pan without losing a single speck of gold. Sometimes, a sample might only turn up some specks. 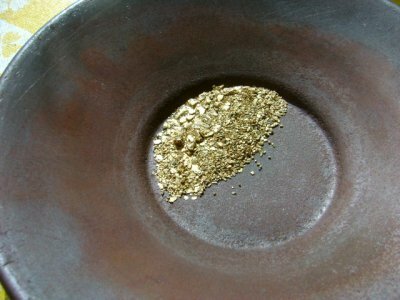 Since you are processing such a small volume of material with a gold pan, it is important to capture every speck. This is not difficult. But it does take a little practice. Flecks of gold are better than specks, but small flakes are even better. 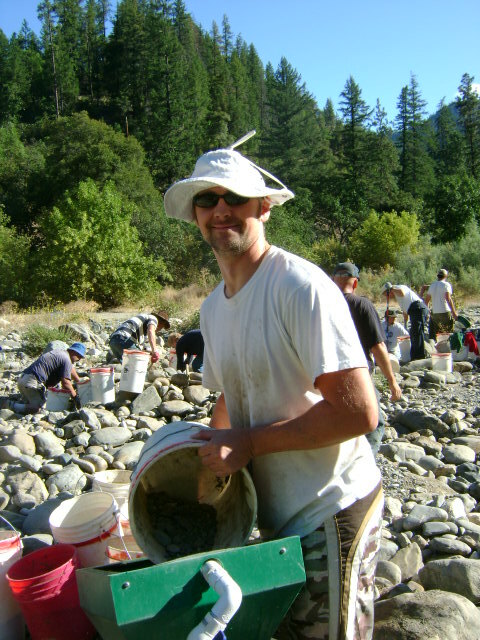 Finding a full-sized flake of gold while panning is nearly always a sure sign that you are on the right track! We spent a lot of time with the participants on Saturday afternoon, comparing results from the different pans, so they were able to begin building some judgment about what a “good” pan result should look like. We showed the best pan results off to everyone. This is so they would be able to relate sampling results to how much gold we would recover out of the very same locations using high-bankers on the following day. To get a head start on Sunday morning, our team leaders set up several high-bankers, strategically located so that buckets of pay-dirt could be fed into them from the places where we would be digging. We do a pot luck dinner in Happy Camp most Saturday evenings during our busy season. The meal begins at 7 PM; but we encourage people to arrive at 6:30 and find a seat. So I like to get off the river by 4:30 or 5 PM. This allows me a little time to clean up and relax. When I left the Mega Hole on this Saturday, most of the weekend participants were still out there panning gold. For some, it was the first gold they ever recovered. They were pretty excited about it. We had a full house at the potluck. I noticed most of our participants were there, though I heard others stayed out on the bar until it got too dark to see what they were doing. Enthusiasm is a good thing!. There are basically two phases to any gold mining program. 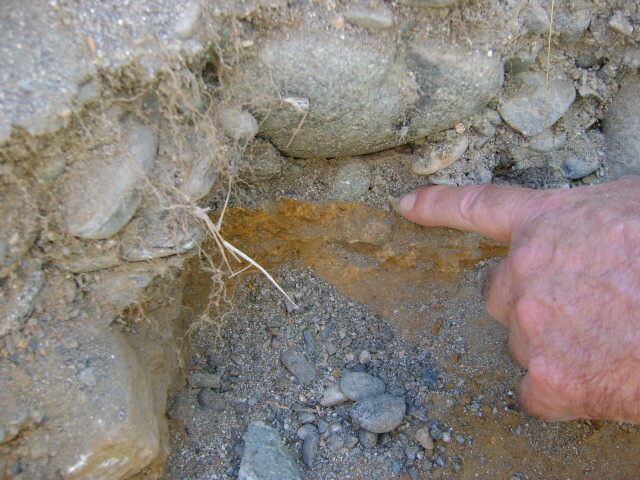 The first thing you have to do is locate a high-grade gold deposit and identify exactly where the pay-dirt is located. Out on this gravel bar, we have established from previous experience that the pay-dirt is sitting directly on top of a distinct layer of deep brown-colored material. There is no mistaking this change in layers if you are looking for it. While the brown layer pays a little, you get more gold for your effort if you leave it alone and just fill your buckets with the material which rests on top. The second phase in gold mining is what we like to call “production.” This is where you try and process as much of the pay-dirt as you can, while avoiding the lower-grade material that exists above, below or alongside the pay-dirt. The natural tendency is to also fill the buckets with low-grade material “just to make sure none of the pay-dirt is missed…” But, since our high-bankers have a limited capacity, for every bucket, or partial bucket, of low-grade we carry to the high-bankers, it will be a bucket, or partial bucket, of high-grade material that we will not process ” meaning that we will ultimately recover less gold at the end of the day. We were excited to have Jake and Lily Urban back with the team on this project. Jake and Lily were present when we began doing the week-long projects several years ago. Both are very experienced gold miners. Jake is one of the hardest workers I have ever met. Like me, he knows that there are no excuses that really matter. It all comes back to how much of the right kind of material that you process. You either get it done or you don”t. That”s the thing that matters if you want the gold to add up. While this “get it done” attitude can be uncomfortable at times during the longer group programs which we organize, I never see anyone complaining when it comes time to split the gold! Jake Urban only smiles like this when the gold is adding up! We normally do not push as hard on the weekend projects. Still, we like to make all organized projects come out as good as we can ” meaning we like to recover as much gold as possible. There is this balance where we try and get as much accomplished as we can without making the experience too painful. We don”t want to kill people off. But we do want to impress upon everyone that with only an occasional exception, positive results can be measured directly to the volume of the right kind of material that is processed through your recovery system. To increase production, I noticed that Jake had his whole team digging while he fed the high-banker by himself. 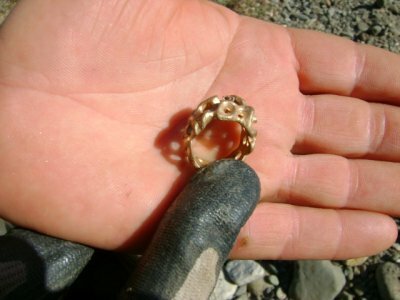 Then he showed us a beautiful and valuable gold ring that he found out there with his metal detector on Saturday afternoon. I tried to tell him it was exactly like the ring I lost out there, but he was not buying it! In all, everyone was having a pretty good time. We have a rule on these weekend projects that says nobody should overdo it. People stop and take breaks and eat a light lunch when they are ready. We try to feed the high-bankers non-stop for about three hours. When the high-bankers run out of fuel, we take the opportunity to show ff some of the gold that we are recovering. This always charges people up to knock out a few hundred more buckets! We recognize it as a sign that the day is nearly over once people start slowing down. This day was cooler than most; so the enthusiasm went all the way until our team leaders decided it was time to stop. Once the high-bankers were shut down, we carefully collected the concentrates from the high-banker recovery systems. “Concentrates” are mostly made up of heavy iron sands which must be separated from the gold. We use a progression of finer-tuned concentrators to accomplish this. The first is a plastic Le Trap Sluice, which when fed carefully, will reduce any amount of concentrate down to about a double-handful — with zero loss of gold. We ran the Le Trap right out on the bar while participants took turns getting a look at our gold, and helped to fill in all the excavations which we had made on the bar. This all took about an hour. Once all the concentrates were run over the Le Trap, it was clear to see that we had recovered quite a lot of gold! There were also some very nice nuggets! This was going to be a good day! After allowing everyone a break to get cleaned up and refreshed, we met back in Happy Camp to finish the clean-up and split the gold. Everybody is invited to watch and participate in the final process during these projects. In all, we recovered more than Â¾-ounce of beautiful gold and some nice nuggets. That”s more than $1,100 in about three hours of work. We could have cashed in that gold to feed everyone pretty well for a whole week! It took a few hours to finalize the separation, split up the nuggets and make sure everyone got fair share of the gold. Children who participate in the work also get a full share. Like I said; I have never seen anyone complaining when it is time to get their share. And it was no different on this project! Because of the existing moratorium on suction dredging in California (until the ongoing Environmental Impact Report is completed), we intend to focus on the other types of mining along our mining properties in northern California this season. This includes panning, sniping & vack-mining, sluicing & high-banking & electronic prospecting and other types of prospecting that do not use a suction nozzle within an active stream, river or creek. We will also be doing our scheduled group weekend projects, which are as follows: June 4 & 5; June 25 & 26; July 16 & 17; August 6 & 7; August 27 & 28 These events are free to all active Members. DFG has decided that “Booming” is not Dredging! High-bank mining with a suction nozzle often involves filling a hole up with water on a gravel bar and then using a suction nozzle to excavate gravel from the hole, usually with tailings water from the recovery system being recirculated back into the hole. This method is normally used when you are working pay-dirt which is located in deeper material, like several feet. In “booming,” water from the recovery system (up on the gravel bar) is directed to flow over the area where you want to excavate gravel from the surface. No hole needs to be dug. You use hand tools to free up rocks, and the water-flow over the surface allows gravel to be washed directly to a suction nozzle which mostly remains in one place. Water movement accomplishes most of the work. This method is most-effective when you are processing pay-dirt which is closer to the surface. Use of vacuums (e.g. shop-vacs) and hand tools above the current water level. It is really good to finally have this matter resolved! Remember: If you are going to use a suction nozzle up out of the water, make sure you are not too close to the active waterway; your excavation should remain small; you should not allow dirty water to re-enter the waterway; and your work area should remain clean and orderly. Here are the Club”s Surface Mining Guidelines. Richard Krimm has been appointed Director of our Internal Affairs. Many of you will know Richard from previous seasons along the Klamath. He and his wife, Connie, live in Seiad Valley during our busy months; they are usually acting as team leaders during our weekend group projects; and are present at nearly every Saturday evening pot luck. Ray Koons, who has shouldered this responsibility all the way back to 1986, will be riding along and providing support and advice to Richard. 1) Disputes between members, or between members and locals or the authorities. This does not happen very often. Sometimes it is about crossing over some private property without permission. Once in a while, members may have a dispute about over a mining area on our properties; who was there first, etc. Our Internal Affairs try to straighten these matters out fairly, always in conformance with our Published Rules, with no exceptions. 2) Uncivilized behavior out on the mining properties or in our campgrounds. There is no call for a single person to make the experience miserable for everyone else. An occasional person comes along who can be vocally unfriendly to everyone else in the vicinity. Maybe someone’s dog turns out to be a menace. Things like this sometimes need to be adjudicated by Club staff with some authority, although it is almost never necessary in The New 49’ers. 3) Our main management concern ties to the concept of “substantial surface disturbance.” Our entire legal foundation with the authorities revolves around this single concept of keeping our cumulative surface impact to a minimum. This is because, if we exceed a minimum standard as a group activity, each individual member will find yourself negotiating your own terms with the authorities. Believe me; it is much easier for everyone involved if we can just internally manage our own affairs! We have succeeded in accomplishing this every season since 1986. But sometimes, it has been necessary for our Internal Affairs staff to ask or help active members reduce impacts which exceed reasonable limits in a group program such as ours. Reasonable standards are outlined in our published Rules. Some of our individual properties have some special operational limitations. When they exist, you will find them explained in our Claims Guide. Sanitation is a big one. Big holes dug on the bank are another big one. This is because the cumulative impact from several large holes could potentially be classed as a “substantial surface disturbance,” and place our entire self-managed program at risk. You would be surprised at how many people just walk away from open holes which they dug! You know who fills them in? It’s our Internal Affairs guys (mostly volunteers)! Sometimes the holes are big enough that they have to organize sizable work parties to fill them in. We had one member who made a large hole on the bank once, right next to the river. Then she refused to fill it in. So our Internal Affairs guys arranged for others to fill it in. Then we wrote a formal letter to that member which cancelled her right to do any further high-banking on our properties. She was not very happy about that. And I was sorry to sign the letter, because she is a very nice lady. Some things are just not easy! Fortunately, in our group, disciplinary action is almost never necessary. The vast majority of members do your best to minimize impact. We have a great bunch of members! The rules are all reasonable, common sense solutions which have evolved over the years — mainly because somebody was doing something that was going to get us in trouble. We could not exist without the rules! And we could not exist without some internal oversight. Therefore, we are all very lucky that Richard has agreed to accept responsibility for this most-important function! 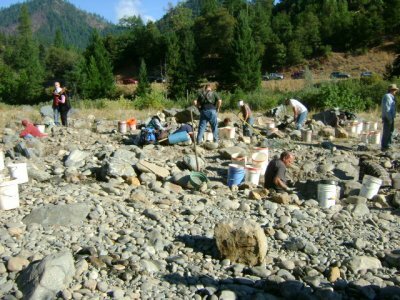 Finding high-grade gold the Rogue River! Oregon Department of Environmental Quality (DEQ) completed an update of its own suction dredge regulations last year and is now issuing annual permits for $25 (same fee for non-residents). More information can be found here. The revised regulations allow a statewide dredging permit for dredges with intake nozzles no larger than 4-inches. Five or six inch dredges can be necked down to a 4-inch ring at the nozzle. There is a special permit available for larger nozzle sizes. 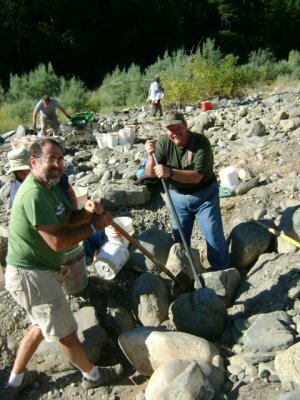 The season on the Rogue River in Southern Oregon begins on 15 June and ends on August 31. There is a very long stretch of the Rogue River crossing Oregon State Lands where members can dredge. 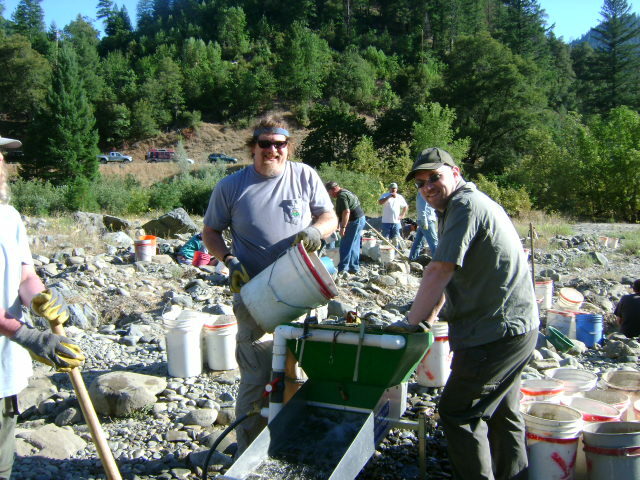 We struck high-grade gold while dredgingalong the Rogue River during both of the last two seasons. I will personally be on the Rogue River providing encouragement to members who wish to operate your dredges along the Rogue during this coming season. 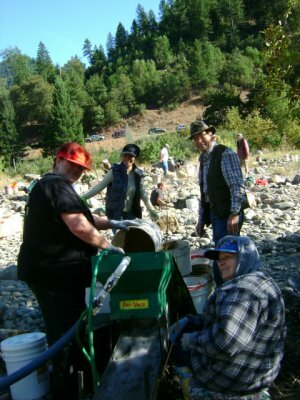 We have a Map and an Access Guide for all members who wish to suction dredge along the Rogue River in southern Oregon during the 2011 season. Members are invited to contact our office for more information. Drawing for 3 Ounces of Gold! Recent legal and political activity has been placing a lot of pressure on our legal resources. Therefore, we have pulled a new fund-raiser together. 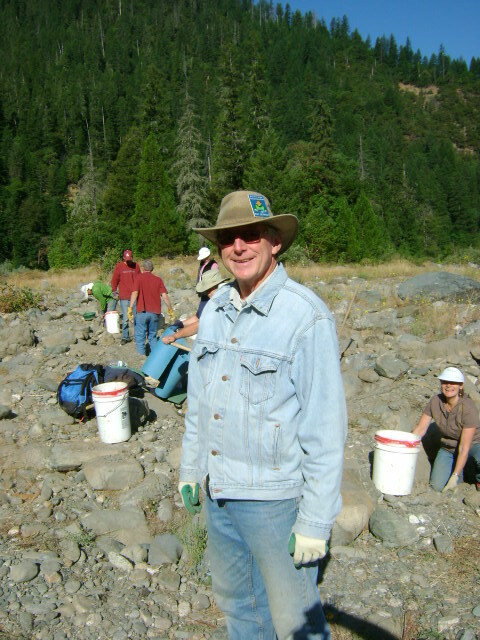 Our existing drawing will be for three ounces of beautiful Rogue River gold that I personally mined last season. We greatly appreciate support from our members! We strongly encourage you to sign up for the free on line version of this newsletter. The Internet version is better, because you can immediately click directly to many of the subjects which we discuss; because the on line version is in full color; and because you can watch the free video segments which we incorporate into our stories. Gold is getting really valuable! 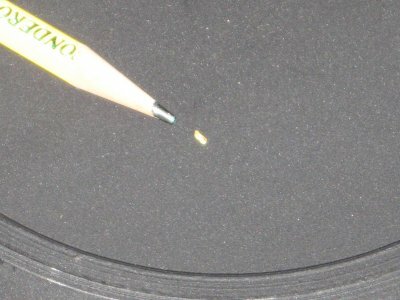 Here is an image of a small piece of gold which Craig Colt weighed out at 1/10th of a grain; the smallest measurement on our powder grain scale. This very small piece of gold was placed just in front of the point on a normal-sized pencil. Check it out; that tiny fleck of gold is now worth almost 33 cents! We used to throw these flecks away. Not anymore! The Happy Camp Lions Club is no longer in existence, so we will be doing our weekly Potlucks at the Happy Camp Grange this summer. We have Richard Krimm to thank for lining this all up. 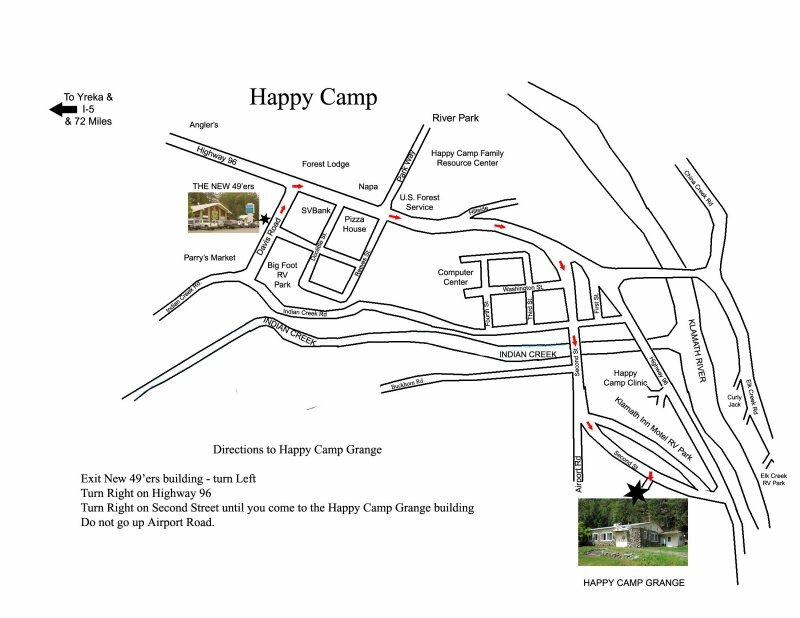 Here is a temporary map on how to find the Grange in Happy Camp. Our first potluck of the season is scheduled for 4 June. Experienced help needed! We have a project to finish in our building that is going to require about a week of time by someone who is experienced in working with concrete (cutting). Because it will happen in one of our public areas, the work needs to be completed (as soon as possible once it is started) sometime between June and September. We are prepared to exchange membership credit for the work. If you are interested, please coordinate through Montine in our office at 530 493-2012.